Unlike Thimphu or Paro or Punakha or Bumthang, Phuentsholing cannot be called as a major tourist destination of Bhutan. However, it remains thickly populated with tourists for a simple reason…. it offers a very easy route of entry and exit by road from Bhutan. 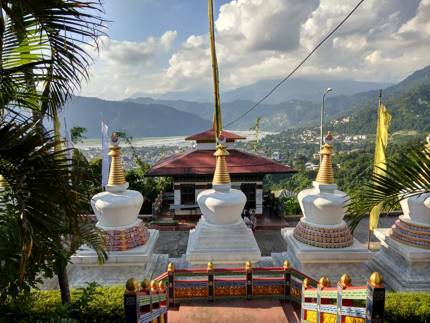 Phuentsholing is the border town of India and Bhutan, so a lot of Indians and foreign tourists who have been touring the dooars-darjeeling-sikkim sides prefer entering Bhutan via Phuentsholing. 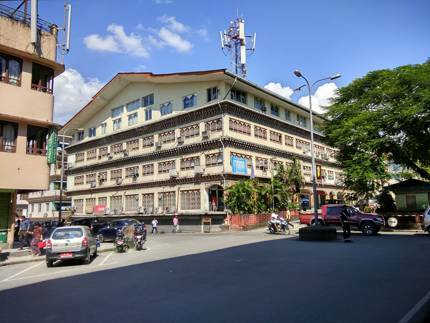 Once you reach Phuentsholing there would be formalities of arranging permits and doing travel bookings (if you have not done all this before) so sometimes it makes sense to stop over in Phuentsholing for a day at the beginning of your trip. There are some interesting places that you can see around Phuentsholing. There are not many tourist attractions in Phuentsholing and you can cover all the below mentioned spots in one day. The Zangtho Pelri Lhakhang is in the middle of the town and you can just walk down to see it. 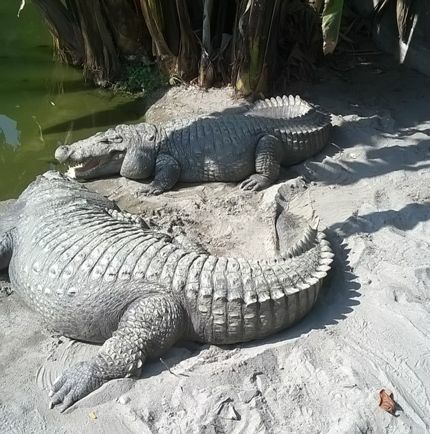 The Crocodile Farm is just 20 minutes away from the town and you can walk down to see that too. The Bhutan Gate of course, you would cross on your way if you are travelling by road from Jaigaon. It's best that you hire a cab from the local taxi stand (it’s on the outskirts of Phuentsholing town on the way to Crocodile farm) to see the Karbandi Gompa, Torsa Tea Gardens and come back by the same cab. The Taxi will charge you around 500 NU and you have to bargain a little hard. Don’t fall for any taxi driver who tries to hard sell 4 points/ 5 points around Phuentsholing to you…there is no need to hire a cab for all the attractions. There is a local bus stand in Phuentsholing but you don’t really need a bus for local sight seeing. Small coaster buses run from the stand and most go to Thimphu while a few go to Paro (Rate is 230 NU). It takes six hours approximately to reach either Thimphu or Paro. 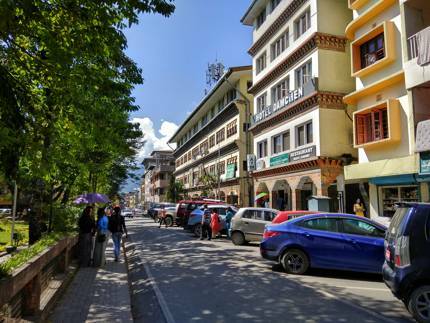 There is a taxi stand too and you can get a shared taxi to Paro/ Thimphu for 600 NU.A reserved taxi will cost 2600 NU (if you bargain hard) to the above places. Rates are higher in peak season. 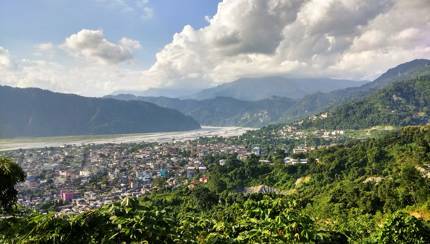 Phuentsholing is a bustling city and has a slightly hurried pace of life. 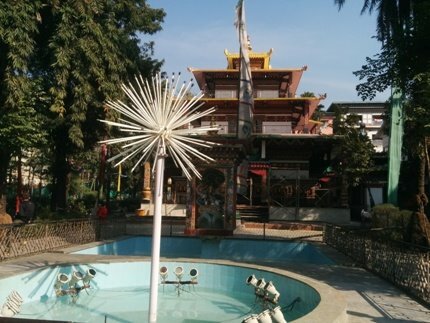 The Zanglo Peri Park containing the Zangdok Palri Temple stands right at the heart of Phuentsholing just a few hundred meters away from the border. The park contains a huge ball fountain, a smallish pond, prayer wheels and a lovely ambience of serenity that will soothe your soul. 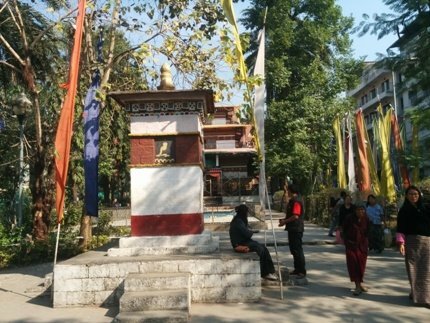 This is like the social hub of Phuentsholing, lovers go for an impromptu date here, tourists are seen people watching and monks wander around... sometimes chanting their hymns loudly. One visit to the park and you will be awestruck at how meticulously it is maintained… even stray leaves are picked up periodically. A good place to sit with a book or a cup of coffee and enjoy the ambience as you go over your travel plans. The Zangdok Palri Temple is a small but spiritually significant temple in Phuentsholing and contains many fine examples of Buddhist drawings. The temple symbolizes the heaven envisioned by Guru Rinpoche (Padmasambhava). 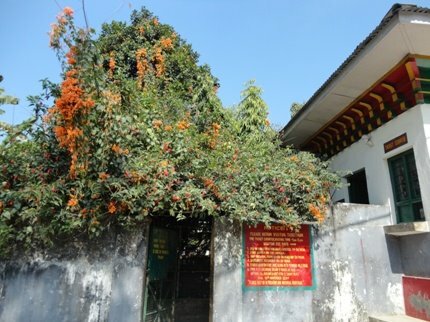 The name of the temple comes from the copper colored mountain which is believed to be the abode of guru Padmasambhava. The ground floor of this temple is covered with huge life size paintings of the life of the Buddha and of course, you aren’t allowed to walk over those portions of the floor. Another specialty of this Lhakhang are the statues of 8 manifestations of Guru Rinpoche and they are Guru Tsokye Dorje, Guru Shakya Senge, Guru Padmasambhava, Guru Nyima Ozer, Guru Dorje Drolo, Guru Loden Chokse, Guru Senge Dandrok and Guru Pema Gyalpo. Per mythology these 8 manifestations represent the ability of Padmasambhava to adapt to different needs and contexts. All these forms of Guru are placed on the ground floor. On the upper floors you will find pictures of Boddhisatva and Shabdrung Ngawang Namgyal and many images of Amitabha Buddha. Open from 9.30 a.m. to 6 p.m. It will take you 15 minutes to walk to the Crocodile Farm from Phuentsholing town. The name Amu Choo is used as the farm is on the banks of the Amu Choo river. First established in 1976, in a small pond, today the Norgay Crocodile Breeding Farm has developed into a major tourist attraction. I first visited this farm in 2010 when I was at Alipurduar for some work. From Alipurduar it took me 35 minutes by car to reach the breeding farm and I was awestruck by the giant size of the reptiles kept there. Now years later in my second visit I could see the increase in the number of alligators and crocodiles kept in the farm. I later came to know that in 2003, there was an agreement between the WWF Bhutan and Nature Conservation Division and many more improvement plans are in the pipeline. Incidentally most crocodile farms in the world breed reptiles for their priceless skin which is then fashioned into belts, bags and shoes. However, the Norgay farms are an exception which breeds these reptiles for releasing them into their natural habitat. 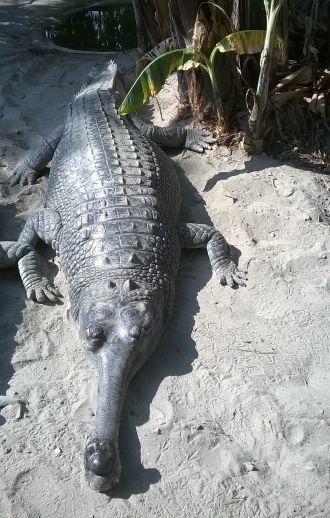 Right now, the Muggar and Gharial (both near extinct species) are bred in the farm. 6 adult gharials now stay there and together they have to be fed 12 kg of fish every alternate day. 15 muggers also stay in the centre and they consume 30 kg of beef every alternate day. Don’t expect too many varieties of other animals and guides around…this is a breeding centre (and not a zoo) with a clear objective: Conservation. Visit this farm in the afternoon when the reptiles are fed…it will be an interesting experience a good place to take kids to as you can explain the conservation chain and food cycle to them. The centre attendant informed me that breeding is still an issue and eggs do not survive because they are not in their natural environment. Out of 200 eggs laid in last 32 years, only 10 have surived to become adults. If you fancy an early morning walk, then there is no place like the Torsa river side. The Torsa river is also seen as you travel upwards from Phuentsholing to Paro/ Thimphu. The best thing about this place is that there is a walking path made alongside the river and vehicles are prohibited from running in that track. At one stretch two streams of Torsa join and that’s a popular place for putting up a tent. You can lie down listening to music and watching stars and have a nice camping experience. You can also visit the Torsa Tea gardens …its about 15 minutes from the border. However, the visit is only worthwhile in summer, autumn and monsoon. 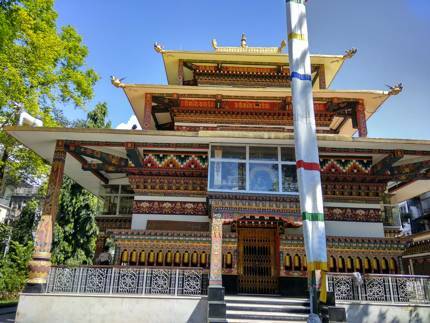 It will take you 30 minutes to reach Karbandi monastery from the Phuentsholing town (take a cab) and it is situated at the altitude of 400 meters on a small hillock. This was the former winter sojourn of the Royal Grandmother…Ashi Phuntsho Choedron. Inside the temple compound there are huge statues of Guru Rinpoche, Shakyamuni Buddha and Shabdrung Ngawang. There is a beautiful garden located outside the monastery that gives a panoramic view of the plains of Bengal and the town of Phuentsholing. There also 8 separate kinds of Buddhist stupas and they are objects worth photographing. Per popular local lore, an Indian pilgrim couple visited the Karbandi and prayed for a baby... their wish was shortly granted and since then couples with infertility issues have been visiting the Karbandi Monastery. The Gate of Bhutan at the Phuentsholing border has beautiful craftsmanship and represents the dazzling show of wood painting that you will get to see once you are leaving Bhutan (Phuentsholing) and crossing over the Indo-Bhutan border towards Jaigaon. Even if you enter Bhutan through a car or an airport, walking across the border is a good experience. 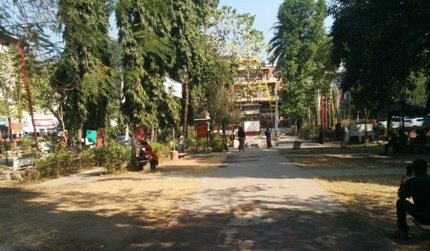 You will be amused to see the contrast between the two cities Jaigaon (dirty, in disciplined and prone to hooliganism) and Phuentsholing (scrupulously maintained and disciplined). 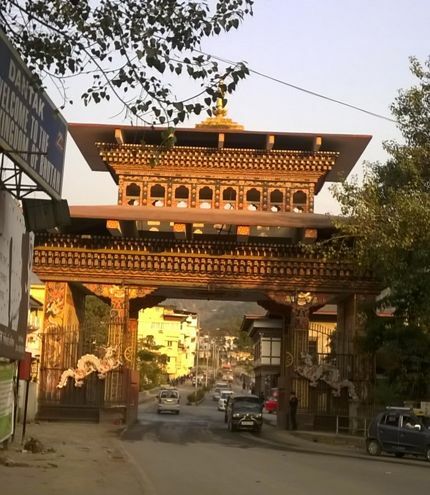 Hundreds of Indians and Bhutanese cross the border every day and it’s a good place to mingle with locals, incidentally, the Bhutan Gate is the most photographed attraction of Phuentsholing.